Western Power Distribution is committed to driving down customer costs and carbon emissions. Hence the company are doing as much as possible to reduce losses, although a certain economic level of losses are required in the normal running of the network. The total quantity of electricity supplied in the United Kingdom during 2015 was 338TWh, but only 311TWh was consumed by customers. The difference between these two values is known as the electrical loss. Ofgem quote a societal cost of £42.48/MWh for losses. Distribution network losses can be broadly defined as the difference between the electrical energy entering the distribution network, from base generation or embedded generators either upstream / same level / downstream networks, and the electrical energy exiting the distribution network, for consumption purposes and properly accounted for it, in percentage terms for a particular period. Raw levels of losses in kWh are of significance for any DNO, but a direct comparison with other DNO losses levels is more difficult: indeed, DNO losses depend not only on the network structure, but also on network energy flows. Losses rates make a comparison between loss and energy flow levels. Consequently, they provide reference values that may be rather comparable between networks, even if they are detailed by voltage level for relevant benchmarks. 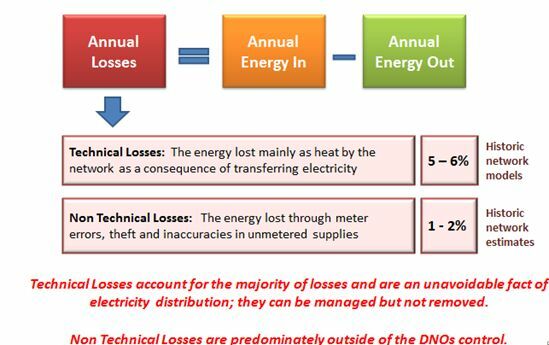 This page provides an introduction to the concept of losses; an explanation of what can be done to reduce them and a comprehensive list of what Western Power Distribution are doing to limit them. More detail on all of these topics can be found in our most recent losses strategy.